Originally a lot of my early travel photos were hosted in Webshots- it was in 2006 and 2007 when WordPress blogs were not popular and I was operating on Blogger platform. Together with the photos, I placed some travel notes and jot down some experience so that other would be traveller could benefit from them. In Sept 2008, I purchase my own domain name and transfer two of my main blogs, Life Blog & Health Blog from blogger to paid hosting. It was a painful one time exercise but I find paid hosting provided a lot of flexibility, features and conveniece that free hosting could not. After transferring everything and reformating some links, updating now has been a breeze. When I have time, I will update some of my travels in my Life Blog. But recently, I was receiving some spam comments in my webshot site – unlike my blogs, Webshots do not allow me to moderate my comments- so I am only informed after the spam comments have been published. I did not check my Webshot account for a while- and when I checked it few days ago, I got a shock. All types of advertisements were placed next to my photos. In 2006/07, Webshots only placed simple Adsense ads and a few innocent banners. Today, these were blantant confusing ads. And when clicking, you have to know where to click to see the next photo (the link is only a small pic). Click wrongly and you click on an ad. I have no say about the ads on my site- if I want it ad free, I have to paid to upgrade to premium. 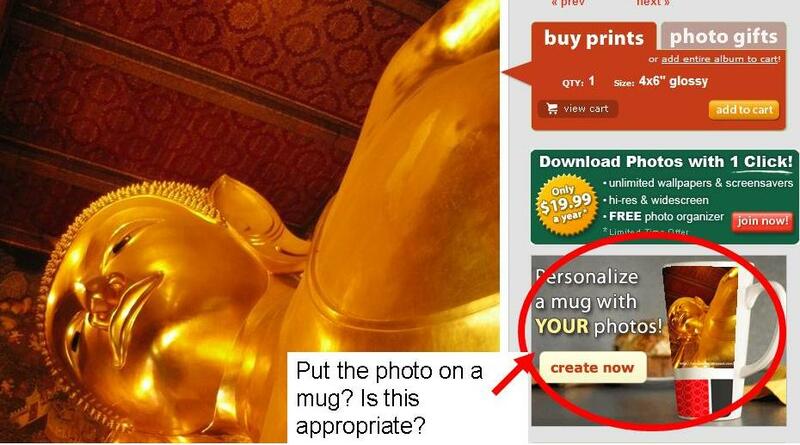 Look at the picture below- it was a photo I have uploaded on Wat Pho- and okay, I know the ads were run by software- but there were advertisement banners on dating and the photo sold in a mug…. this is the thing that made me even more determined to do the transfer. As bloggers or web enthuasists, we all aim to provide information at the most convenient form possible for our visitors. We strive on tweaking and constantly improving our blogs/sites so that navigation is easier. If it is an ad, I want my visitors to know they’re clicking on an ad. Therefore, I made the decision to create this blog on Thailand detailing my travel and experience. 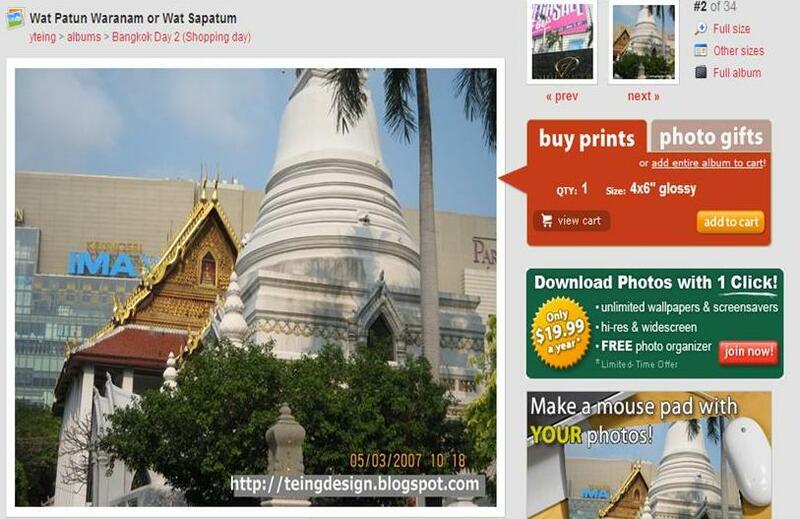 I can have all the photos of one place in a page so that you can get the info you need at a glance. It’s time consuming to manually create pages and upload photos- I also have to go into each of my photos in Webshot to check if I had writen notes- and to have the notes transferred as well because the essence of my travel then were captured in the notes. But I would what to do it right once and for all. Fortunately, I have extra holidays due to Raya and the lack of sleep and rest will not be affecting my job productivity. But as I complete some pages, I began to thank Webshots- after all, if they have never plastered all sorts of ads, I would have never thought of moving the photos. And if I have not done so, I would not be able to see the results that I do- which pleases me. Because uploading photos and writing on the blog in the long run is easier for the blogger as well as for the reader. It is my sincere hope that you this site will provide you with the information you need. Soon, I will be creating blogs on Angkor Wat and Sri Lanka, in a similar way as how I am doing for this blog.